Father’s Day is coming up. Thankfully, it doesn’t get the same pre-holiday build up as Mother’s Day, but it does get some advance warning – they’re talking about it on the radio, cards are in stores, and there are a handful of web-based ads reminding us to do right by Dad. I obviously don’t have plans for Father’s Day. It’s not a weekend that Matt and I would typically go to Atlanta – at least not specifically to celebrate. In all likelihood, it’ll be a day spent doing laundry and getting groceries. Like every other Sunday. That is not to say I don’t miss Dad. I do. I also miss trying to find a good card. One of the last cards I ever bought him is still stuck to the fridge in the mountains. It’s starting to fade and mildew. The question becomes, how do you get through the days that specifically point out your loss? Birthdays, anniversaries (wedding, date of death) – how do you commemorate the absent? I should probably do something tree or bird related. Over the weekend, a conversation I had with a friend made me start thinking once again of getting a tattoo. I’m not going to do it. What I began thinking about, instead, is a second small stud in my ear – just one side. 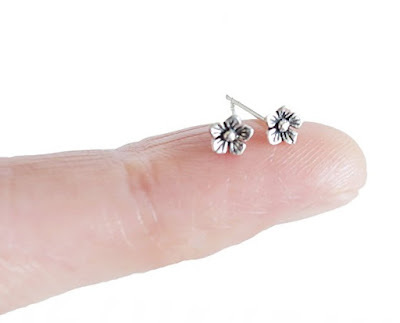 I’m just saying – there are some cute earrings out there, and if I hated it… no big deal, take it out. Something like this. Yes? No? I was looking at the small earrings used for this purpose, and my colleague walked by. I kind of flippantly suggested that I wanted a scar as proof of my pain. And then I realized that’s exactly why I’ve been thinking about it. Grief and sadness don’t come with a cast that people can sign. You don’t lose your voice. You don’t get stitches, or a shot. So why not make your own scar? I guess. I haven’t decided for or against the new bling at present, but I’m willing to entertain your thoughts on it. The idea of a scar is an excellent one. The saying "Time heals all wounds" doesn't exactly cover it, does it? Even when the wound of losing someone heals there's still a scar--just not one that's visible. Although something tree-related is also a good idea, a way to mark the passing of one life by planting a new one.